On the surface tree stumps don't appear to be a problem. Tree stumps on your property can be an eyesore and annoying. Despite that many property owners simply choose to ignore them. However, they can be a source of disease and infection for other neighboring trees and shrubs on your property. Hiring a professional tree care service company that offers stump grinding is important to restore the beauty and safety of your property. When grinding is done, unlike traditional stump removal procedures there's no chance it will grow back. When you decide you want to get rid of a stump for good give us a call. Listed below are some reasons why tree stump grinding is favored over other traditional stump removal techniques. Using an axe is back breaking work, time consuming and unsafe plus the stump may continue growing. We use state-of-the-art equipment operated by professionally trained and experienced operators. Grinding equipment takes little effort and in just a few hours it leaves no trace of the stump. If you desire to preserve the beauty of the surrounding landscape such as flower beds, gardens or lawn intact stump grinding is the way to go. The machines are very accurate and efficient. 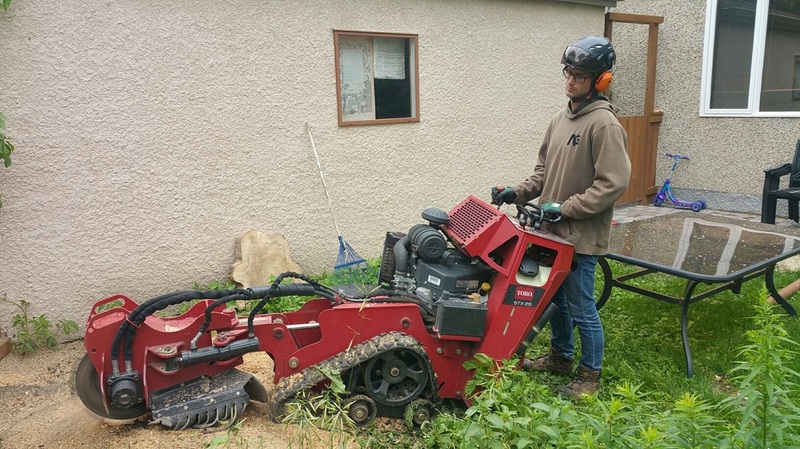 There is no risk of damaging the adjacent environment like traditional stump removal methods. You can expect everything to go very smoothly when handled by our professionals. A stump grinders produces small shreds. You can use them as mulch on your plants to retain moisture. You can use them in your garden to keep weeds out. They can also add beauty to your garden as decorative feature. The number one reason stump grinding is the preferred procedure for stump removal is because it is considered environmentally safe. It is the best way to prevent the spread of diseases to trees in the surrounding landscape. If you have another tree on your property the best way to insure its' continued vitality is to remove a stump with a grinder. When you consider the value a tree adds to your property grinding stumps makes for a exceptionally good investment.